See Ya Later, Sweet Potater! To make the dipping sauce, in a medium bowl, stir cheese wedge until smooth. Add sour cream, ranch seasoning, chili powder, and 2 tbsp. water. Whisk until smooth. Cover and refrigerate. Flip fries and cook until tender on the inside and crispy on the outside, about 15 minutes. Carefully transfer fries to a large bowl. Top with minced garlic, olive oil, and garlic powder. Using two forks or spoons, gently toss to coat. Return fries to the sheets. Bake until minced garlic begins to brown, about 2 minutes. Sprinkle with Parm-style topping, and serve with dipping sauce! How hard is it to avoid French fries? SO HARD. Not only are the darn things absurdly delicious, but they also seem to come in an endless number of tantalizing variations. 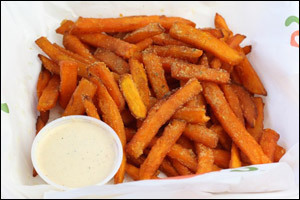 Sweet potato fries tossed with Parmesan cheese and garlic? That's not even fair! The good news is that you don't have to abandon your desire for fries -- not even those maniacally tempting ones from Chili's. That's why our French fry swaps exist! 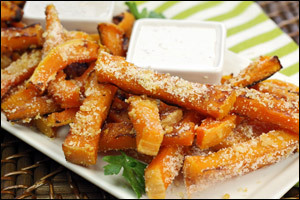 Butternut squash is an incredible substitute for starchy sweet potatoes. And by baking butternut spears and tossing them in just a teensy bit of olive oil, we're able to re-create sweet potato fries with a fraction of the fat and calories. Factor in some reduced-fat Parmesan, plenty of garlicky goodness, and a doctored-up dipping sauce, and skipping the Chili's version doesn't feel like a hardship at all. Open up and say om... followed by nom... and another nom. Om nom nom! Click "Send to a Friend," and invite a pal over for fries!